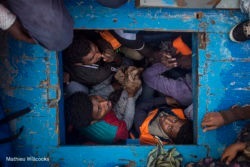 Eritreans migrants seen cramped in the hold of a large wooden boat which carried approximately 540 men women and children, mostly Eritreans. 2016 was a deadly year of migrants and refugees trying to cross the mediterranean from Libya’s coasts to Italy’s. With ever increasing numbers of unseaworthy boats attempting the crossing, charities and NGOs like MOAS are often overwhelmed. MOAS, together with medical teams from the red cross, operates two rescue vessels, the Responder and the Phoenix, just off the coast of Libya. They sit in international waters and await either the distress call from migrants lucky enough to have been given a satellite phone by their smuggler, or to visually find migrants boats – often in the dead of night. Then the race to rescue them before it too late starts. © Mathieu Willcocks/MOAS.eu 2016, all rights reserved.